The business aviation industry is still reeling from the general worldwide economic decline of the late 2000s and early 2010s. However, there is a glimmer of hope on the horizon – the digitalization. It may be disrupting the industry, and yet it is injecting it with new life (cf. our presentation at this year's European Business Aviation Convention EBACE in Geneva). To understand the challenge of chartering business jets, you need to understand the evolution of this idiosyncratic and still-immature industry. Within the next few years a genuinely digital platform for matching dynamic supply and demand will emerge and business jet options will become transparent and immediately purchasable. The impact of this change could be sufficiently disruptive to create a new market segment emerging between the luxury of private aviation and the mass-market airlines. We call this segment "personal aviation". We present our findings from interviews with around 30 industry experts and the results of an online survey carried out in collaboration with CorporateJetInvestor.com. Our expert interviews, online survey and market research revolved around two key questions: How is the business jet industry dealing with the challenges it faces today, and how do stakeholders see the industry developing? 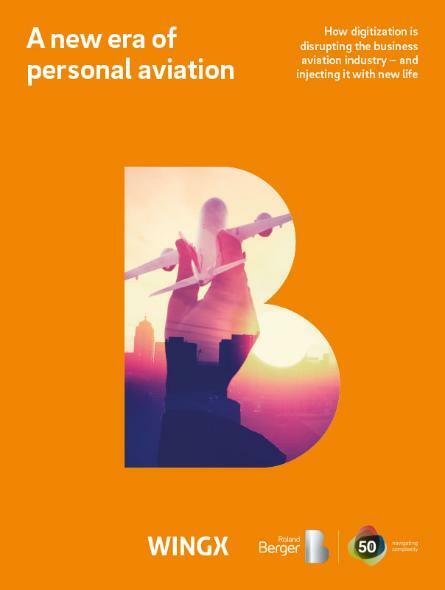 This study has been jointly conducted by Roland Berger and the business intelligence firm WINGX and represents our joint vision of the future of the business aviation industry.